« J’accuse! A failure of American Musical Journalism. MUNICH — Bavarian State Opera’s irredeemably banal 2009 Aida has been spiffed up and its awkward action scheme apparently restudied for a fall run here. Even so, the honors at Monday’s performance (Sept. 28) belonged firmly with the musicians, instrumental and vocal. Mannheim-based conductor Dan Ettinger exerted a Karajan-like grip, stirring Verdi’s music from the bottom up, parading its rhythmic strengths, brashly stressing percussive detail, and inevitably drawing attention to himself. Which is not to say he drowned everyone out: he accompanied attentively and savored well-rehearsed balances. The Bavarian State Orchestra cooperated gamely; the Bavarian State Opera Chorus sang with rare refinement in clear Italian. Krassimira Stoyanova acted so credibly and poignantly through her essentially lyric voice that nobody would have guessed she is new to this opera. Her sound was pure and unforced, her phrasing properly noble for the title role. Amneris suits Anna Smirnova better than did Eboli here four seasons ago, but her communicative singing in Acts III and IV followed a numb, robotic portrayal before the Pause. Jonas Kaufmann proved he can sing Radamès outside of studio conditions, and thrillingly, starting with an exquisitely shaped Act I Romanza and progressing to generous, imaginative ensemble work. 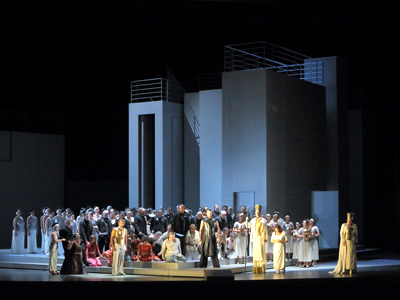 Franco Vassallo’s warm and unstrained Amonasro, Ain Anger’s formidable Ramfis, and Marco Spotti’s eloquent Rè d’Egitto completed a straight-A cast of principals. This entry was posted on Wednesday, September 30th, 2015 at 12:03 pm	and is filed under Munich Times. You can follow any responses to this entry through the RSS 2.0 feed. Both comments and pings are currently closed.